The Interactive Adventures of Dog Mendonca & PizzaBoy is an iPhone game that is based on a trilogy of graphic novels that were published in the U.S by Dark Horse Comics. It is a horror themed adventure game that was developed by OKAM Studio with close input from both the writer of the comics; Filipe Melo, as well as illustrators Juan Cava and Santiago Villa (who wrote the story and illustrated the game respectively) and is published by Deep Silver FISHLABS. The game takes place in the haunted city of Lisbon which in the lore is the world's monster capital. You play as Eurico; a former pizza delivery boy who now works for occult investigator Dog Mendonca and who finds himself caught up in a bizarre criminal case. Along the way you team up with a middle aged werewolf, a severed gargoyle's head, as well as a demon trapped in a little girl's body. The game is said to be packed full of homages to horror films, b-movies and nerd culture. From the trailer (I will include below) it looks to be in the mould of old school adventure games and seems to have been made with care rather than as a quick cash in as it looks pretty attractive. I have a copy of the game so when I have played it I will be able to provide more detail on just how fun an experience it is. I hadn't heard of the graphic novels this is based on so it will be interesting to see if not having read them is a hurdle. 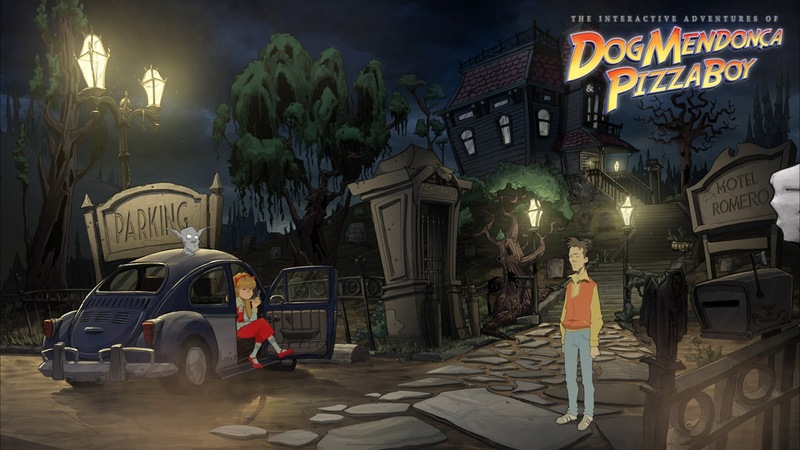 The Interactive Adventures of Dog Mendonca & PizzaBoy is available now on the Apple App Store and costs $4.99 U.S, £3.99 U.K, and 4.99 Euros in Europe. The press release says this cost gives access to all chapters and features with no additional charges, the game is due to be released on Android devices in the near future and is available on PC.